If you wish to see the heart and soul of fashion, go to their trade shows! Whether you are any designer, private label owner, a seasoned fashionista, or just a regular trend follower, attending trade shows is a rewarding opportunity to know fashion and its business very well. Because aside from the clothes and the wonderful pieces of art accessories, trade shows will showcase more than boutique racks and fashions shows. There, you’ll meet the creators and the future fashion influencers of today’s generation. Not only that, trade fairs are also great platforms to build new connections, keep abreast with the industry’s latest trends, play a spy on your competitor’s activities, promote your business in a cost-effective way, and of course, keep your name alive in the industry. In Paris where fashion hegemony is evident, an influential fashion tradeshow called Tranoï has been making waves for more than two decades now by recognizing young but superior creative designers and artists. 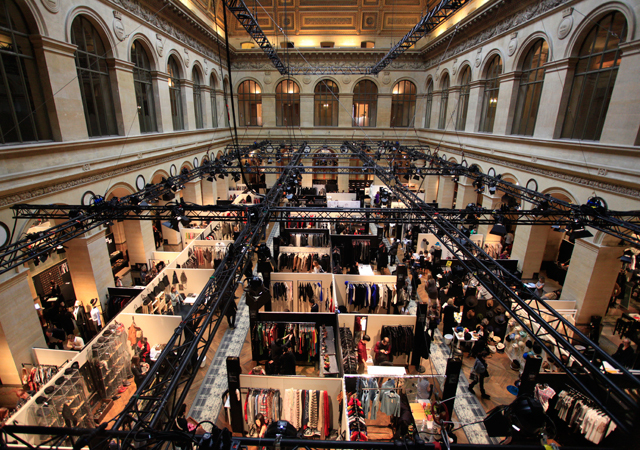 Founded in 1993, the Tranoï tradeshow was formed to deliver premium brands and designers under one roof. After Michael Hadida’s takeover in 2003 as the new General Manager of the show, Tranoï experienced a big leap higher as the leading fashion fair trade in Paris because of his extensive industry knowledge and professional network. From a pure women’s event in 2003 with one venue and 65 exhibitors, it expanded shows for men and eventually became the crème dele crème of the world’s fashion artists achieving what it is now “a not to be missed date in the Paris Fashion Week calendar”. With more than 1000 designers in 2011 who presented their collections in Tranoi’s three exclusive venues all over Paris, it’s no doubt it’s an empire that is no lightweight. Today, Tranoï is “the” event to follow for international designers, buyers, fashion press and the fashion interested public. More than a commercial gathering, Tranoï – in Italian which means “between us” – is an artistic platform with a tight selection of more than 1000 premium designers from all over the world, created for them to meet the most influential fashion ambassadors. This selection makes the trade show what it is: a valuable source of truly different, international creativity, high-quality and outstanding talent. High-end designers from all directions of fashion make up the heart of Tranoi’s business. And while we see the point that the fashion industry gets dominated by the west, there’s a gamut of noticeable and flourishing talents now who have penetrated this tradeshow over the past years. Over the years, we’ve noticed a bunch promising brands that are actually made by Asian designers looking to make inroads in the lucrative U.S. fashion market. Based in Hong Kong, Native Stranger is focused on bringing elevated fashion to the everyday consumer. Their concept is all about drawing from a new location from a certain season. Arrive as strangers with a clean palette, leave as natives with an appreciation for local traditions and inspirations. They bring new life to familiar basics and common silhouettes that are easy to wear by exploring and infusing found inspiration into the seasonal collections. Native Stranger’s Men and Women labels take a modern and minimalistic approach to the contemporary basics. Heliopolis, an accessories business founded in Singapore in 1990 to provide exquisite costume jewellery with refined workmanship at affordable prices. Heliopolis is now a renowned brand that creates intricate and extravagant jewellery adored by exclusive fashion boutiques and exclusive department stores from around the world. Evam Eva is a luxury knitwear brand out of Japan specializing in fine gauge knits.The brand is committed to organic and sustainable manufacturing practices and predominately use natural dyes and fibers. Based in the Philippines, Celestina is a collection of investment and high end bags that use exotic leather, crocodile skin, and other natural materials with a contemporary design touch. The story of Celestina began in 2006 with a collection of minaudière. Combining artisanal techniques, contemporary design, and the raw mystique of the natural world. With every season, Celestina expresses unconventional unions, bringing together rare skins, stones, and metals with rigorous craftsmanship and informal attitudes. True to Tranoi’s innovation philosophy every year which is to give its patrons and partners more comfort, more services, and more new things to make up a good season, the opening of 2015 highlights a sharp selection of brands from high quality and outstanding young talents all over the world. They are the young artists who have a vision above today’s trend, who avoid falling into fast fashion, street wear, anything that’s common. Tranoi offers them the possibility to get into contact with the most important buyers worldwide who come to visit the show every season. Held last 27th June to the 29th June 2015 at the Palais de La Bourse in Paris, France, Tranoï Preview successfully organized a three-day event in an advanced calendar to give a better rhythm to deliveries of the next exhibit. In this year’s Tranoï Preview 2015, new in the edition were dedicated to the man and to the pre-women’s collections. It will share two main locations: the Palais de La Bourse and the Carrousel du Louvre. Luis Buchinho, the brand that designates the designer namesake is on the market for 20 years. He is a constant presence since 1991 at Moda Lisboa, in Portugal Fashion since 1996 and in Paris Fashion Week since 2009.The designer is distinguished by his experience in knitwear, a current feature of the brand. This aesthetic defines a cosmopolitan look, aiming for the charismatic and the authentic. Italian designer Elia Maurizi has become an institution in the fashion world for contemporary designs and luxurious fabrics. Famed for contemporary footwear, Elia Maurizi started his fashion career as an apprentice at just eleven years of age. He was later discovered by the “WHO’S ON NEXT” competition held by Alta Roma, Pitti Immagine and Vogue and went on to present his first collection to great acclaim. Contemporary and effortlessly stylish, our edit of men’s Elia Maurizi shoes feature weathered moccasins, classic lace-up styles and contemporary Chelsea boots. Rugged with an elegant edge, this brand is your go-to for fashion-forward accessories. Ambas is an Italian brand that creates beachwear and lounge clothing. Ambas has built a remarkable stamp on women’s fashion wear, by combining simplicity and refined garments with elegance and versatility. Ambas swimwear collection is made in Italy with the softest Italian lycra. They also combine Italian creativity with Indian craftsmanship, developing precious cashmere fleece handmade by master artisans and dresses, ponchos, djellabas, kaftans, all with velvet finishing made in 100% organic cotton gauze. Ambas is embraced by fashion iconic characters such as Kate Moss, Uma Thurman and Caroline de Monaco. Beautiful timeless brand for contemporary women. Susana Bettencourt is from Portugal. It is where her passion for knitwear and traditional lace techniques were developed. Relocating to London to undertake a BA in Fashion Knitwear at Central Saint Martins College of Art and Design, Susana continued to hone her knitwear and women’s wear skills through an MA in Digital Fashion at London College of Fashion. Having instantly gained high praise and recognition, for her sculptural knitwear and luxury high-technology fabrics, Susana continues to explore the boundaries between technology and hand-crafting knitwear techniques, developing the jacquard to the extreme in order to make textures and volumes in detail. Experimental designs to create new fabrics and a passionate belief in future fashion are at the core of Susana Bettencourt’s signature. Boldly embellish and digitally aware designs, Bettencourt’s kaleidoscopic knitwear, prints and accessories are future-ready. Tranoï is more than tradeshows. It also includes artistic installations, designers exhibitions, catwalk shows, fashion parties and all sorts of events which arouse the dreams and desires inherent to fashion. This event showcases product from Apparel & Clothing, Cosmetics and Beauty Products, Leather & Leather Products, Textile, Fabrics & Yarns, Business Services, Lifestyle & Fashion industries. Check the complete list of designers who participated in this year’s Tranoï Tradeshow. Visit their website here!